Are you scared that you're gravy won't be as good as your mother's? Here's a recipe that will work for anyone. 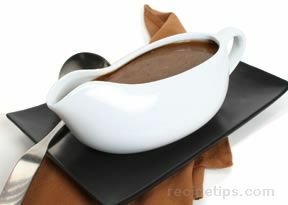 You will pour this gravy on your turkey, mashed potatoes and dressing. Skim off all but 2 tablespoons of fat from turkey drippings in roasting pan. Stir in broth or water. 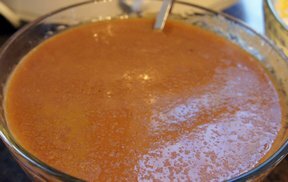 Cook over medium heat, stirring to loosen brown bits; remove from heat. 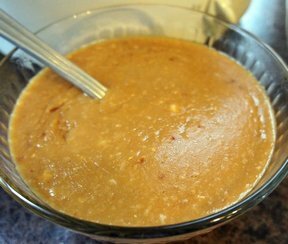 In a small bowl, combine corn starch and 1/4 cup cold water, stirring until smooth. Add this mixture into roasting pan. Stirring constantly, bring to a boil over medium heat and boil 1 minute. "Loved your turkey or it could, also, be chicken gravy. I do this same thing and it was what my grandmother would do, many, many years ago, too. I always thickened gravies, sauces or stews with corn starch. Now it is essential that I do so, as my husband is gluten intolerant. Thank you for showing folks that corn starch is a great alternative to flour. Of course, you have to cook it until it no longer tastes "starchy," but the process is quicker with corn starch." "Definitely use broth, not water for this recipe. Not enough drippings to flavor it up enough with water."